Teahouses have become synonymous with the Everest Base Camp Trek and with trekking in the Himalayas in general. To those not familiar with the term, tea houses are not so much houses that serve tea, but are rather small bed-and-breakfast-like hotels that are dotted along most of the treks in the region. They are the most popular form of accommodation for travellers to the Everest region as they provide an easy, pay-as-you-stay approach to trekking in one of the highest areas of the world. ‘Tea House Trekking’ as it is aptly named, involves trekking most of the day for 5-7 hours, starting and ending in the small Sherpa towns along the routes where the various tea houses are located. They are easily identifiable by the large signs outside their doors reading ‘tea and coffee’, ‘hot showers here’ and ‘we have electricity’. The typical tea house will provide all the basic amenities needed for comfortable, yet humble approach to trekking in the Himalayas. A single bed, a hot meal, the option of a hot shower and some electricity are what is to be expected when staying in the iconic tea houses. We highly recommend ‘tea house trekking’ as it exposes you to the local people, who are very accommodating and friendly. It also shows you a side of Nepal that you may not see if you decided to camp by yourself as well as providing the opportunity to meet like-minded trekkers! It must be stated that not all tea houses are the same, so differences in quality are generally quite marked, especially as you change from the lower altitude towns to those up at high altitudes. The incidence of tea houses will also vary according to the popularity of the trek you are on. The Everest Base Camp Trek and its variants are very popular, attracting over 30,000 visitors annually, so there are many tea houses along the its trails, most of which will be reliable. On popular treks and at lower altitudes most tea houses will have flush toilets and hot water showers, usually at a cost of around US$ 4. As you move higher up the trail, toilets will start to become manual flushing toilets (using a bucket) and eventually long drops. The scarcity of hot water also increases with altitude, so most tea houses will offer a pot of warm water, heated by a fire, with which to wash yourself. The communal area in tea houses tends to be the dining room, in the centre of which will be a large yak dung burning stove to heat the whole house. This is a great spot to socialise with fellow climbers or just to revel in the heat that the stove provides! The typical price of a night in a tea house will vary on different treks and at different altitudes. Expect to pay between US$ 5-10 for a well-equipped, trusted tea house per night. If you decide to travel with a tour operator or with a guide/porter, they will usually organise the tea house accommodation in advance and will include it in their trip package. Here is a great video diary by Eva zu Beck on EBC teahouses. Read our detailed article on costs for more information. Almost all tea houses offer twin rooms – two single beds about 1m apart with a small bedside table in between. There will be a pillow, sheets and bed cover included, but we recommend using your sleeping bag or a pillow liner for hygiene reasons. The sleeping bag can also come in handy as the nights get very cold, especially higher up in the mountains. Using ear plugs would also be a smart choice as the walls are very thin and not well insulated. For more information on all the gear you should pack, read our Everest Packing List. Most tea houses have electricity for lighting as well as for a few plug points, usually located in the communal areas. They will charge US$ 3-5 per hour for the use of the plug points, which are typically in high demand – especially in the busier tea houses. Some tea houses will have internet access and offer Wi-Fi hotspots at a charge. These are usually unreliable and not all tea houses will have connections, so we recommend purchasing a 3G sim card to use for the duration of your journey. Mobile connectivity is very good in the entire region and the prices are affordable. Read our article on internet connectivity on the Everest Base Camp Trek to find out more. The benefit of using tea houses when on one of the more popular treks is that you don’t have to worry about regular meals and carrying hiking food. All tea houses will provide a variety of hot meals, prepared on-site and made with love! Unfortunately, there is not much choice, as the meals tend to be varieties of each other, with a few changed ingredients. As all ingredients have to be flown into Lukla then carried up the mountain by yaks or porters, meals will tend to be dominated by flour and cereal products. Bread, porridge, beans, rice and dumplings are the staples of any meal. These will be served with vegetables, usually lentils, to form what is the national dish of Nepal – Dal Bhat. We recommend staying away from meat dishes as they tend not to be fresh, and therefore safe for consumption. In accordance with the religious beliefs of the Sherpas, no animals are to be slaughtered in the mountains, so all meat products are carried up to the tea houses by foot – often over many days. Stick to the traditional rice and vegetable variations, vegetable soups and eggs in the morning and you should be safe and well-nourished to tackle whatever pass or peak lies before you that day! For a detailed look into food on the Everest Base Camp Trek, read our article here. We recommend using tour operators, as they will have the advantage of knowing which tea houses are the best and will be able to book your rooms in advance. If you intend to trek without guides, make sure you arrive at your tea house before 7pm to be sure that there is still food being served and enough beds free for your group. To ensure you stay in reliable tea houses, stick to the popular routes and ask fellow trekkers where they are staying. Finally, take extra precaution in the tea houses as they are not world renown for their levels of hygiene! 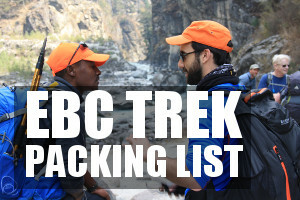 Bring a pillow cover, use your sleeping bag and stay away from meat to ensure you have a happy trek. Hi – I’m doing the EBC Trek via Goyko in Oct/Nov 2018. Do you know if there are any book shops in Namche or book swaps in any of the tea houses en route (English novels) to save me taking books (I don’t have a kindle). Hi Kim, many tea houses have a small selection of books available in them. I’m sure some will be receptive to swapping books. HI. Do you have an idea what the tea houses charge per night. I will be doing a solo trip and want to ensure i have enough cash with me. Hi Dawood, prices vary from teahouse to teahouse. The cheapest teahouses are around $7-10 a night. On average, I would say they are $15-$20 a night. Hi, I am doing the trek solo in May as well. I was just wondering if I have to book in advance for the teahouses or do I just show up with cash? Do they accept american? Hi Ashley, May is a busy month so some teahouses may be fully booked but generally you can find a bed in most villages. It may be worth emplying the services of a porter to run ahead and make a booking for you each day. In terms of payment, cash is preferred. It is unlikely any teahouse will accept card. How busy is it likely to be in mid dec-early jan on the gokyo and EBC trekking routes in terms of tea houses? Do I need to book in advance (I am picking this isnt an option!) also can i pick up a guide for cho la further up the trail? Is it ok to go to gokyo first over the pass then into EBC? I was thinking to get a guide just for the cho la section? Hi Kerensa, Dec-Jan are quiet months so pre-booking teahouses is not necessary. As for getting a guide for the Cho la Pass, this is a good idea. You should be able to find someone in Gokyo who can help, but this is not guaranteed. Please also note, that the pass may be closed due to inclement weather / snow cover. Going via Gokyo to EBC is a standard route so no problem here. All the best! Hey Mark, really useful information, thanks. I am planning to hike to Everest in June 2019 and will be self hiking without a guide. I am concerned about booking the tea houses along the way and wondered if there is a company you can recommend that will just book these for me if I give them my itinerary? My other question is, on reaching Base Camp, would I need to provide my own tent etc, or are there tents you can hire as a treker for one or two nights? Hi Nick, I’m not aware of any company that can pre-booked teahouses. Most companies book teahouses on the day of travel as they use porters to charge ahead and make these bookings, you may want to hire the services of a guide or porter to do this for you. In terms of base camp, most trekkers do not sleep here. 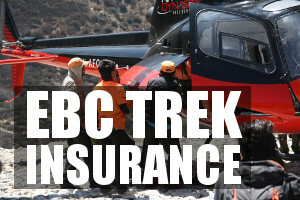 In fact, it is really difficult to arrange an overnight stay at base camp itself. 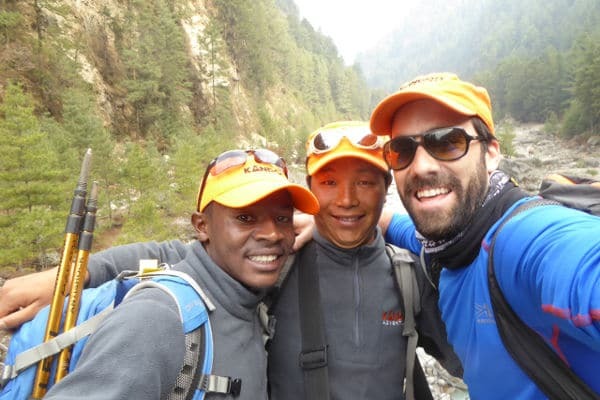 To do so you will most likely need to engage the services of a company or very well connected guide that can get a you sleeping tent with one of the Everest expedition teams. Almost all trekkers sleep at one of the teahouses in Gorak Shep (which is about an hours hike from EBC). I am planning a solo trip in october and will be staying in bunkhouses,When I get to base camp where can I spend the night ,Or will I need to bring a tent. Hi Malcolm, all trekkers stay in the little town about 1 hour south of EBC called Goark Shep. There are a number of teahouse in this town. The only way to stay the night in EBC is to find an agency with connections to climbing teams, and then arrange a night in EBC on their permit.